And that’s all of the Canadian national anthem I know. And so I sang it….for the whole 10 days we bounced around the country. It drove my husband completely mad and he encouraged me to at least learn a few more lines while we were there. I didn’t. In my defense, I wanted to got to Peru, hike the Inca trail and see Manchu Picchu before it closes. However, after scheming, compromising and preparing for hostels, planes, trains and automobiles in exchange for a nearly 5-figure vacation, I started looking into alternatives. Fabien chose Quebec and Montreal and I chose the Canadian Rockies and Vancouver. I won based on the fact that I do all the planning. 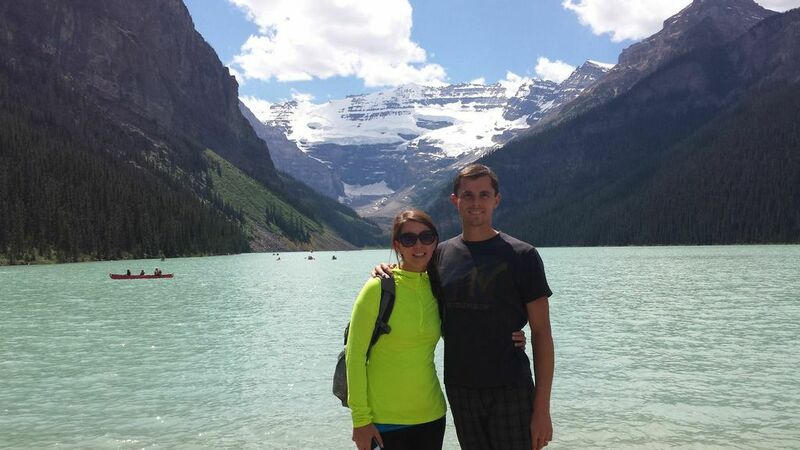 We flew into Calgary and quickly skipped over the city, heading straight to the Canadian hot spot of Banff. The original plan was to rent a car in Calgary and drive across country to Vancouver. That is until I found out going that direction (and not in the opposite direction) carried a one-way charge of $1,500. Clearly, Canada is smoking too much medicinal marijuana if they think I’m paying that. So, I booked a bus with a tour company, who cancelled our reservation weeks later. It was then that I realized it was cheaper to fly across country than drive. Geeze, Canada – you are a logistical nightmare. I needed a vacation after planning this vacation. 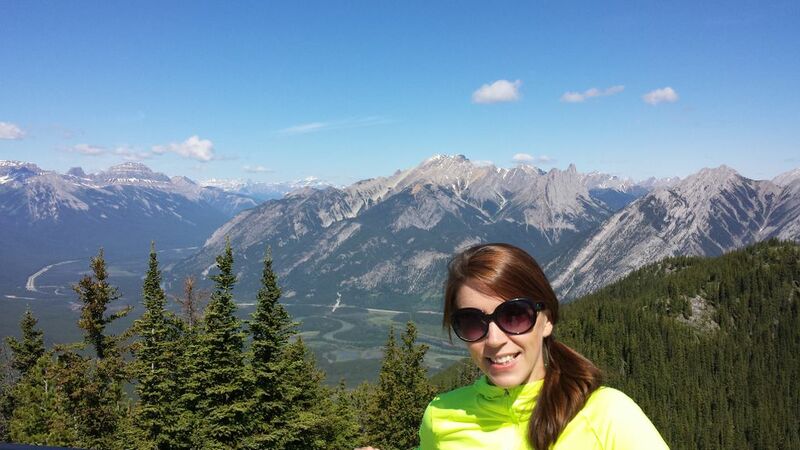 Now, I’ll stop complaining about first world travel problems and tell you about Banff. It is freaking amazing. The mountains, the air, the 70 degree weather, the blue skies, the mountain tops, hiking to the mountain tops, the rivers, the lakes, the glaciers – all of it is perfection. We spent our three days there hiking, worrying that we didn’t have bear spray and staring at a 360 view of the Canadian Rockies. 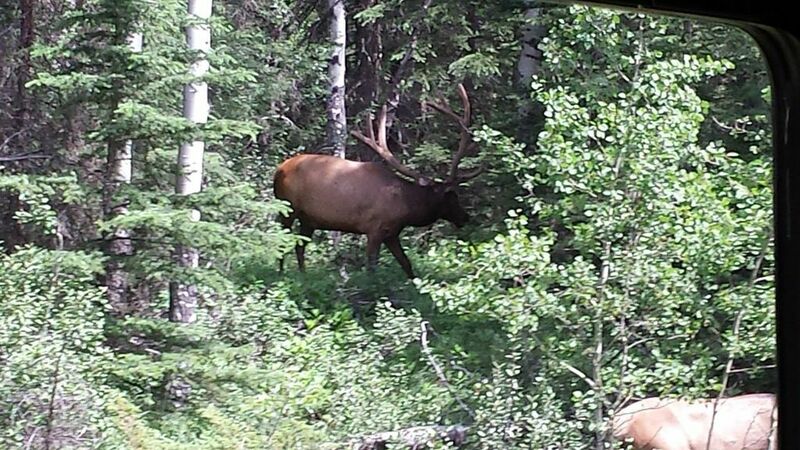 My favorite afternoon consisted of seeing a ginormous elk with countless points, glacier gazing at Lake Louise and viewing the bluest water I’ve ever seen at Lake Moraine. No photo filter here, people. Have you ever seen water so blue? 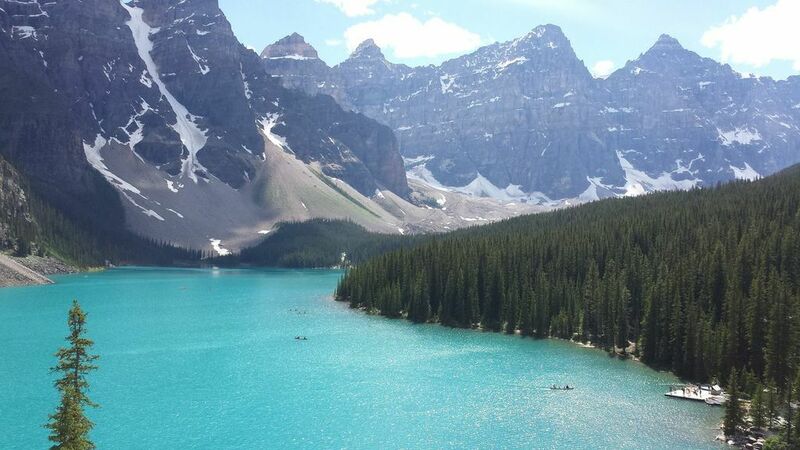 Lake Moraine is stunning. 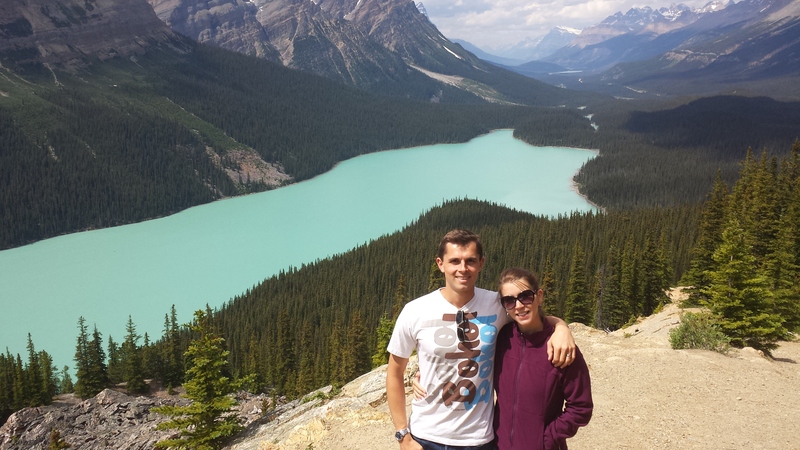 After three days, we rented a car and drove the 200 mile Icefield Parkway from Banff to Jasper. I purchased this great app, Gypsy Guide, that gave us a tour of the Parkway. For $4.99 we learned the history of the mountains, where the most beautiful hidden lakes were located and the best places to spot wild life. The drive took us all day because we stopped everywhere and took our time taking in the beautiful scenery. There were two main attractions of the day. 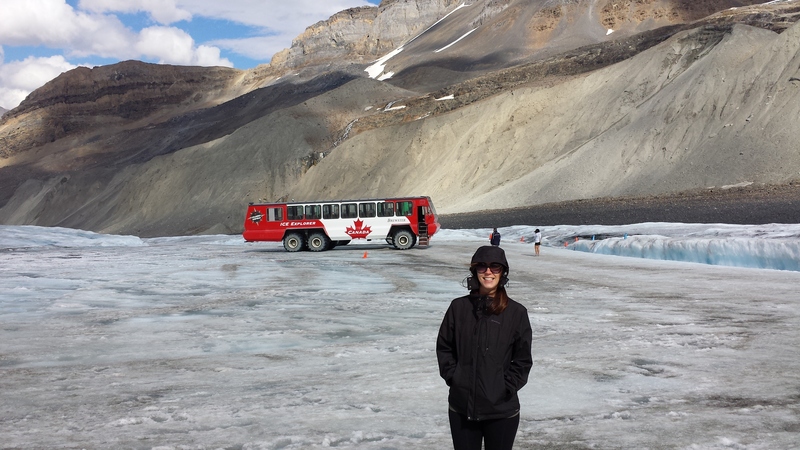 The first was a 2-hour stop at the Columbia Icefield where we rode an Ice Explorer to the Athabasca Glacier and then got to walk around, take pictures and drink the pure blue water. It was really cool. And the 2nd was when I saw a bear and screamed the announcement so loud causing Fabien to slam on the brakes, bust a viscous u-turn and nearly causing a multi-vechile pile up in the middle of nowhere. 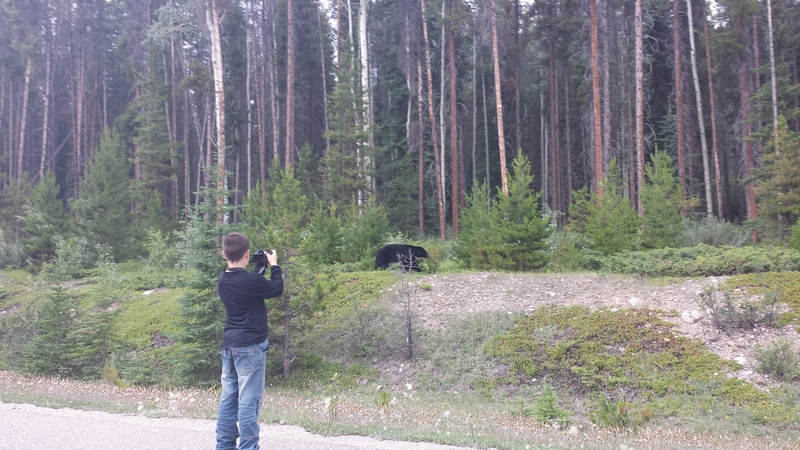 It wasn’t in vain because I saw two black bears and have the photos to prove it. The world’s bravest kid (or the child with the world’s stupidest parents). By dinner time we stopped in Jasper (think Northern Exposure), ate dinner and quickly drove to a little middle of nowhere town, Hinton, to spend the night in a sleazy Econo Lodge (the only hotel for hundreds of miles). The next morning we drove through the most boring landscape on the entire planet to Edmonton where we flew to Vancouver. To view more pics of Canada, click here.